Generally speaking, taking your laptop on a flight is a hassle, particularly if you’re in cattle class. Not only do you have to specially screen it through the x-ray machine, but all it does is take up space in the overhead compartment while you sit idly in your seat, wishing you could get some work done or at least watch the movies you picked. You could try and set your notebook on your tray, but you know you’d end up bumping into your neighbor’s airline dinner. The advent of netbooks in the last year has made it possible to use a laptop on the plane, except the screen is too small and the processor too weak to enjoy movies in high definition, and it’s nearly impossible to type long enough for you to get any work done without cramping your hands. If only someone could design a solution. Enter Japan Airlines. 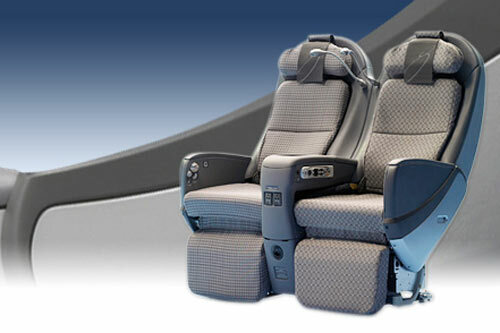 The airline recently won a Japan Industrial Design Promotion Organization (JIDPO) award for its new international premium economy seat. The JAL Sky Shell Seat just happens to come with a tray big enough for a fully opened A4 sized (roughly 8.25in x 11.75in) laptop. This means that you’ll finally be able to use a decently sized laptop on the plane while both you and your friends on either side of you remain comfortable. As an additional bonus these seats are constructed with a special ‘shell-shaped sliding seatback’ so that you don’t lose any space when the person in front of you is reclining, meaning you can use your laptop even when the guy in front of you decides to take a nap. The seat first appeared on Japan Airline’s Tokyo-London flight last year, and is now available on a multitude of flights. The list seems to be expanding rapidly. Tokyo-Moscow and Nagoya-Paris were added just last week, with flights from Tokyo to Chicago and Los Angeles adding the seat next April. This is in addition to already existing flights from Tokyo to Amsterdam, Frankfurt, New York, Paris, San Francisco and Osaka-London.